HGV First Aid Kit. 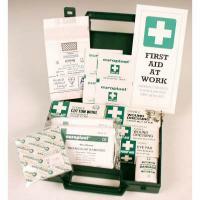 Well organised medical first kit for HGV drivers and Haulage operators. 1 x Premium No.8 Medium Dressing. 1 x Premium No.9 Large Dressing. 2 x Triangular Bandage Non Woven. 1 x White Open Wove Bandage. 1 x Absorbent Cotton Wool 15g. 5 x Plain White Gauze Swabs. Caterpillar Duck Carpenter Workwear Trousers Waist 32", Leg 32"